One of the best wall brackets around, the Ultimate Wall Bracket has a 1.25m clearance from the wall and is perfect to hang body bags, straight bags and any other punch bags you wish. This wall bracket has been made to a commercial standard with box steel construction. This means it can take just about any punishment provided you attach securely to a suitable wall - made simpler thanks to the slotted holes that accommodate uneven walls. This wall bracket comes with a swivel closed loop and is finished with an epoxy powder coating that allows for indoor or outdoor use. Ensuring your punchbag is securely fastened will be a priority whether at home or in the gym. 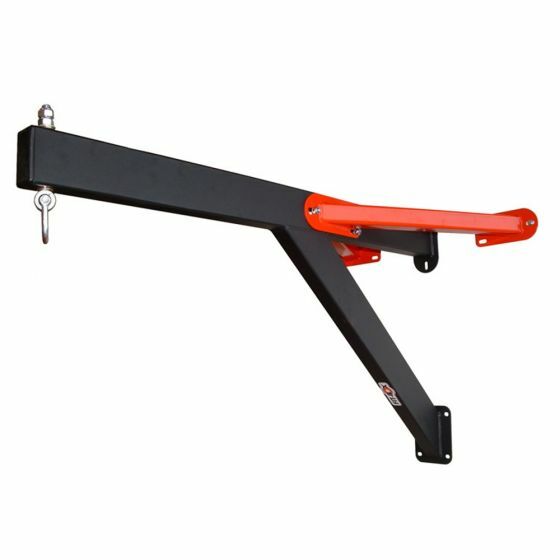 This 1.25m ultimate wall bracket is a commercial boxing accessory that allows you to hang your body bag or straight bags safe in the knowledge they are secure. The bracket comes with a swivel closed loop - the swivel hook having a self lubricating bushel that can also be replaced. The heavy duty construction is from box steel which ensures it's status as a commercial accessory. This is then finished with an epoxy powder coating that means this bracket can be used indoors or outdoors if you wish. Attention to detail means Jordan Fitness have manufactured this wall bracket to have slotted holes to ensure you can attach even when the walls are uneven.